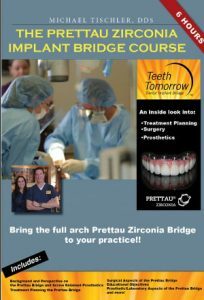 If you want to bring the Prettau full arch screw retained implant bridge to your practice this is the course to take. Since 2012, Dr. Tischler has accrued a vast amount of experience with this full arch treatment delivering hundreds of arches in his practice and thousands through his lab. Dr Tischler’s documented success rate in his practice of 100% for the prosthetics 1-5 years in function and 99.4% of implants speaks for itself. This six-hour online course is a toolkit to educate you on all treatment planning. surgical, laboratory, prosthetic, and implementing this full arch modality in your practice. Both guided and non-guided treatment is shown as well as in-depth coverage of alveoloplasty, osteotomy, reflection and suturing techniques. Both immediate load and staged treatment are addressed from both a surgical and prosthetic standpoint. Award-winning dentist and nationally recognized educator and author, Claudia Patch, DMD shares her expertise in prosthetics to reveal her best practices and guidance to achieve exceptional results. In addition, Dr. Tischler discusses team building, strategic marketing, and the importance of leadership and focus in your professional endeavors. When Patients feel the Prettau® Quality, They Just Get It! There is no better way to demonstrate the aesthetics, durability, and function of Prettau® Bridges from Tischler Dental Laboratory than to put one into your patients’ hands. Upper and Lower arches are individually available and come attached to a clear base to display implant placement. Storage case included. Upper and Lower arches can be ordered individually and come attached to a clear base to display implant placement. Storage case included.